A new study published by the National Bureau of Economic Research discovered an established link between the number of universities in a country and its gross domestic product (GDP). The comprehensive study, titled "The Economic Impact of Universities: Evidence from Across the Globe," evaluated universities in 1,500 regions across 78 countries since 1950 and is one of the few that explicitly shows the link between prevalence of universities and economic health, according to the authors. "We have found robust evidence that increases in university presence are positively associated with faster subsequent economic growth," they found. 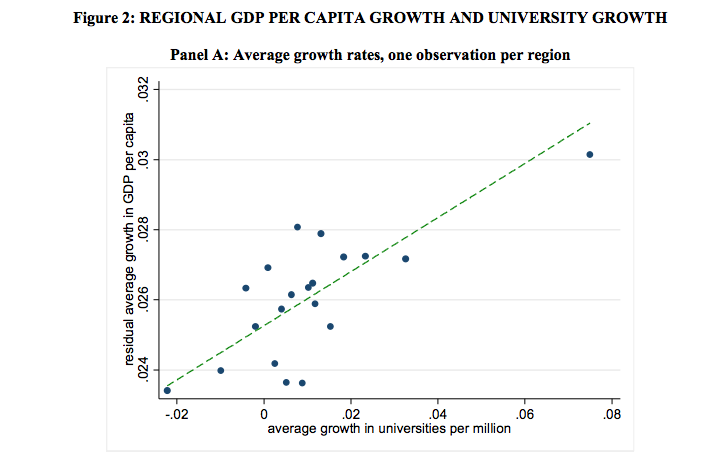 "Doubling the number of universities is associated with over 4% higher GDP per capita in a region." The study discussed four different factors that may contribute to the reason increased universities leads to increased GDP. Higher university presence correlates with greater skill supply meaning a more productive workforce, spurs innovation, contributes to stronger pro-democratic attitudes, and increases demand for goods as students, staff, and universities purchase more locally.